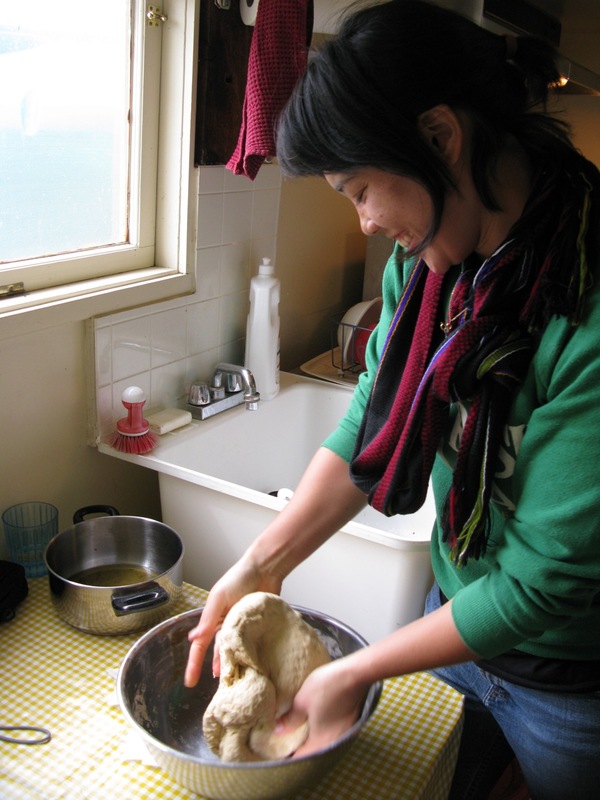 The past two Thursday mornings, I've woken up at 4:30 a.m. to take Lucy to her early shift at the bakery. We've had some hot afternoons, and despite growing up in California, I don't always cherish the sweat that comes with composting and digging in the heat; plus, I tend to really like mornings, so getting to work early is actually something of a treat. So on these early mornings, I've started off double digging beds. The lovely Lucy says more about that here, but basically it involves clearing a bed of old plants and weeds, moving around the topsoil and forking the subsoil to aerate things and make them nice and fluffy to accommodate new plants. Anyway, this past Thursday, my bed just happened to be full of bunches of volunteer potato plants, which I had to pull up as weeds. 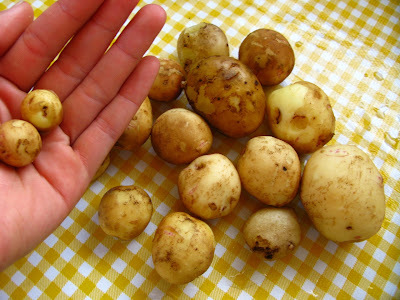 Happy surprise, when I forked up the roots and pulled up the poisonous green leaves, I was rewarded with bunches of new potatoes! New potatoes are just as they sound: the little new potatoes that form first on potato plants. They don't store too well because their skins haven't yet hardened, so you don't always find them in supermarkets, but their thin skins and buttery soft texture makes them absolutely delicious and perfect for potato salads and all kinds of yummy dishes that call for minimal prep and potatoes at their most potatoey. 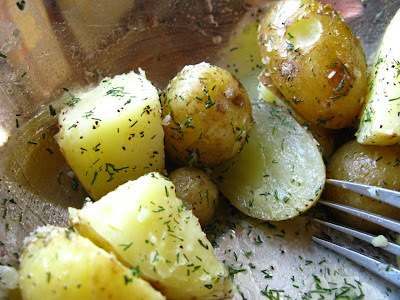 Cut bigger potatoes into manageable chunks (or not, if you don't mind cooking a little longer). Steam potatoes in a steaming basket for 15-20 minutes, or until done (you can check by poking one gently with a fork). The simple bowl of potatoes goes quickly in a crowd. 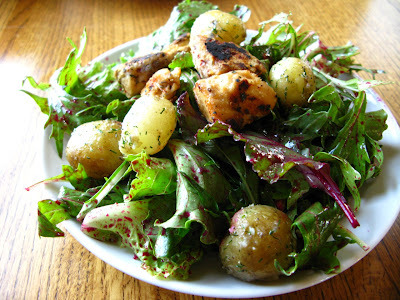 The potatoes are the perfect topping on a bed of greens. We also added some blackened pink salmon chunks, roasted pumpkin seeds, and black olives for our own Northwest version of salad nicoise.